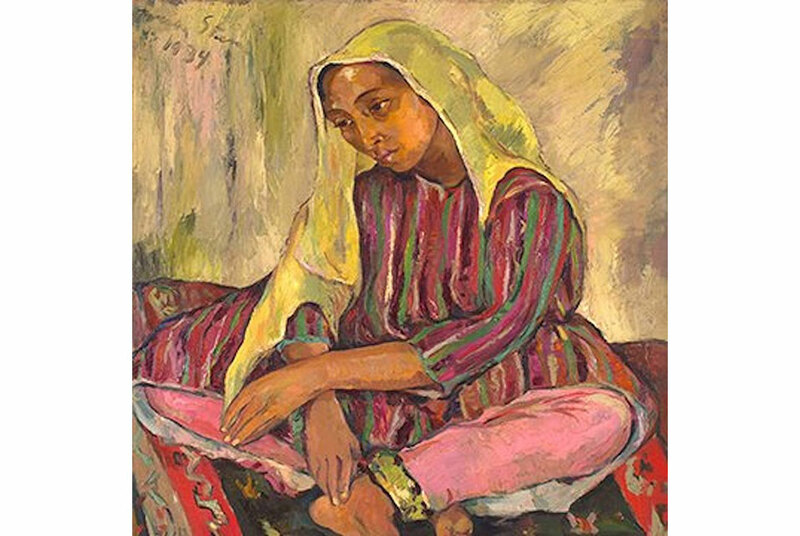 Irma Stern, Meditation, Zanzibar, Estimate: £800,000  £1m. The Shill Collection, Cape Town. CAPE TOWN.- South Africas leading auction house, Strauss & Co, announced details of its extraordinary offerings from two major private collections due to be sold at its much-anticipated 18TH March 2019 auction in Cape Town at the Vineyard Hotel. Art highlights from this sale include three scintillating portraits of single sitters by South Africas top artist, Irma Stern, dating from her acclaimed Zanzibar period. And there are works from Sekoto and Preller at the height of their power. Sterns commanding portrait, Meditation, Zanzibar (1939), originates from the artists first visit to Zanzibar. Stern was keenly aware of the second-class status of women in this former sultanate in the Indian Ocean. Her portrait is marked by the great dignity and melancholy of its sitter. The extent to which Stern was seduced by what she saw as the islands mystery, colourfulness and exoticism is abundantly expressed in the illustrated 1948 travelogue Zanzibar 2 that she published after her second visit to the island in 1945. Such was the effect of her Zanzibar visit that Joseph Sachs, writing in 1942, suggested that Sterns Zanzibar paintings are the high water mark of her art. Canvases are full of gorgeous colour and the strange mysterious atmosphere of this tropical island, but they have also recaptured the spirit of the diverse humanity that is found on the East Coast of Africa. Indeed, so enthralled was Stern by the rich visual culture of Zanzibar that she brought back a pair of Zanzibar doors, which she had installed as the front door to her Cape Town home The Firs in Rosebank, and also began framing her Zanzibar paintings in frames made from Zanzibar woodcarvings. Meditation is a particularly fine example of this aspect of Sterns Zanzibar work. On the one hand it perfectly illustrates the languid mystique of the exclusively feminine world of the harem, filled with ... lovely old eastern silks with heavy gold fringes, [the women with] trousers ruched at the ankles with the frills falling over their feet. Heavy perfumes hanging in the air  expensive, penetrating Eastern perfumes. But on the other hand it is more than a voyeuristic, orientalist glimpse behind the veil. The intensity and pathos of the womans expression suggests a strong empathy between Stern and her subject suggesting the possibility of a shared humanity. Portrait of an Arab (1945), which is a previously unrecorded portrait of a member of the Omani nobility from the court of the Sultan of Zanzibar. The sitter, cloaked in a black subaiyah replete with gold piping (indicating his standing in the royal court), bears a striking resemblance to the Sultan. Stern describes White bearded figures belonging to another age - a thousand years or more back; gold glistening on their coats, silk woven into their rainbow coloured turbans, wound artfully, each particular race having a different traditional way. Their hands gesticulating, their faces expressed depths of suffering, profound wisdom and full understanding of all the pleasures of life - faces alive with lifes experiences. The present lot is a previously unrecorded work by Stern in a series of only four portraits known to exist that depict noble figures from the court of His Highness Sultan Sayyid Sir Khalifa II bin Harub Al-Said, who reigned as the ninth Sultan of Zanzibar from 1911 to 1960. A cadet branch of the Al- Said dynasty of Oman, the Sultanate of Zanzibar was established as its own principality in 1856 after a succession battle between the sons of the deceased Sultan of Muscat and Oman, Said bin Sultan Al-Said. Despite this apparent separation, the nobility of the Zanzibari court maintained their Omani heritage as evidenced in the colours of the sitters turban, commonly referred to as a mussar. Reserved exclusively for royalty, the specific combination of blue, lilac, purple and orange is known as a Saidi mussar and has been used by Omani nobility for over three centuries, with the present-day Sultan, His Majesty Qaboos bin Said Al-Said, donning the colours for official state occasions. The Mauve Sari is one of several remarkable works in this genre dating to 1946. Presumably produced either from sketches done during Sterns second stay in Zanzibar in 1945, or in response to meeting the wives of Indian merchants in east Africa on a trip to the Congo and present-day Rwanda in mid-1946, these works attest to Sterns daring juxtaposition of vibrant colours and her increasing attention to richly varied patterns. When Stern published Zanzibar (1948), her remarkable account of her second trip to the island in 1945, she commented repeatedly on her encounters with the local Bahora community. Originally Hindi traders who were gradually absorbed into the larger Muslim community, Stern described the surroundings of these wealthy merchants and their families as gay and colourful, the furnishing of their homes as modern. Noting at one point that it was lovely to see Bahora women resting in groups on the green lawns of parks, or sitting at the seaside to get a fresh breeze, she referred again and again to the saris they wore, even those of ten-year old girls, which she described as expensive. Astutely observant, Stern mentioned saris that were as fine as cobwebs, or brocaded in real gold. Attending a dance held in a dark house in the Bazaar, women sat on the floor in all colours imaginable, combining the most absurd colours, and yet looking most beautiful, like a heap of multi-coloured gems shaken together. These extraordinary powers of observation are immediately evident in Sterns inventive exploration of form and colour in The Mauve Sari. Importantly, though, the artists careful attention to detail extended beyond her fascination with saris to include what she described as the shining black hair and eyes, and the fragile, elegant bodies of the Bahora women she encountered on the island. Although, in The Mauve Sari, the sitter averts her gaze, thereby affording the viewer a chance to take pleasure in the voluptuous painterliness of the composition without transgressing her privacy, this work is perhaps most remarkable for Sterns fine sense of balance between calm introspection and lively animation. In 1945, after a lengthy stay in Cape Town, Gerard Sekoto moved to Pretoria to live with his mother and stepfather in Eastwood. The two years he spent in this settlement before his departure for France, via London, represent the highpoint of his artistic career. Already attuned to describing aspects of black urban life following creative sojourns in Sophiatown and District Six, Sekoto concentrated on producing gregarious studies of domestic life marked by their formal innovation and painterly maturity. Dominated by the mustard tones in the foreground, Sekotos palette is sensuous rather than exuberant, his brushwork attentive without being overly precise. Despite his naturalistic approach, elements of his painting remain mysterious. For instance, the identity of the two male cyclists wearing hats is hidden in shadow. Similar to Sixpence a Door (1946), a comparably toned work from the same period, Sekoto imbues this study of quotidian life with a warm glow. Sekotos frontal vantage, which places him on the dirt road, immersed in the comings and goings of Eastwood, bears notice. It distinguishes this lot from a better-known earlier work, Cyclists in Sophiatown (1942), in which Sekoto described the hurried, mechanistic quality of township life by portraying a group of male cyclists from a removed vantage. Eastwoods future erasure wasnt yet known when Sekoto first exhibited this work at Christiaan 'Christi' Truters eponymous gallery, most likely in 1947. A former lover of Alexis Preller, Truter opened Christis Gallery in 1946. His inaugural group exhibition included work by Sekoto. In April 1947 Sekoto held a successful solo exhibition at Christis and in July participated in a New Group show at dealer Joan Ginsbergs Gainsborough Galleries, where this work was also shown. In September he left South Africa on the Carnarvon Castle, never to return. Painted in 1952, Collected Images by Alexis Preller is a seminal piece by this highly regarded artist. Illustrated on the cover of Esme´ Berman and Karel Nels 2009 monograph of the same name, Collected Images depicts a cabinet with 18 compartments and is a resonant catalogue of the artists key metaphors. Conceived in a rented Pretorian cottage in the heat of a blazing creative streak, and executed with a cool, mature confidence, it reads as an ingenious and beguiling account of the artists imagination. Precious, endlessly fascinating, meticulously painted and gorgeously coloured, Collected Images is a landmark, museum-worthy picture. Relying on a strong, rectilinear, trompe loeil composition, the canvas is divided into eighteen equally-sized compartments, each containing an intriguing, Prelleresque vignette or object. Familiar fragments and motifs hint at the artists early career phases and influences. That such diverse images could be collected together so delightfully and coherently shows just how eloquent and convincing his visual language had become. The image in the bottom left compartment a near restatement of Icarus, a small but hugely important painting from 1951  gives a possible clue to a broader theme playing out in Collected Images. Not only does its humble egg box provide the larger paintings rectilinear format, but it alludes to the idea of, and the value in, protecting what is fragile, embryonic and cherished. This favoured theme found different symbolic forms throughout the artists career.